When I was a kid, I was a big fan of Robin Hood. I remember reading at least two books recounting the legend and I watched the Errol Flynn version of the movie several times. 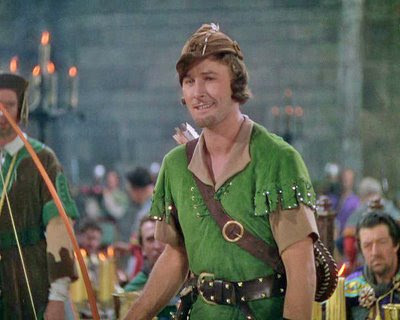 And, as an adult, I saw both the Kevin Costner and Russell Crowe versions of Robin Hood. None of this makes me an expert, but it does allow me to state with some confidence that Robin Hood was not a left-wing hero who stole from the rich and redistributed to the poor. Instead, he was a quasi-libertarian tax protestor. Okay, maybe it’s an exaggeration to claim he was a libertarian, but Robin Hood was on the side of ordinary people who were being exploited by incessant tax demands from the ruling class. His main enemies were Prince John and the Sheriff on Nottingham, not the medieval equivalents of Wall Street. In the Russell Crowe version of the movie, Robin Hood even gives a speech about the importance of liberty. So you can imagine how irked I get when statists agitate for things such as the “Robin Hood Tax” in this moronic video. 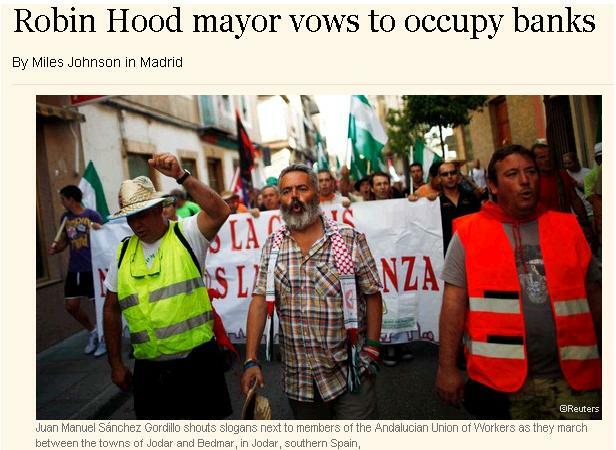 But what motivated me today is a story in the Financial Times about a Cesar Chavez wannabee politician from Spain. But if the Mayor really wants to make robbers pay, he should march straight to jail and turn himself in. Not for the empty publicity stunt of robbing grocery stores, but for being part of a political class that has dramatically increased the burden of government spending in Spain, from about 30 percent of GDP in 1980 to well over 40 percent today. But don’t hold your breath waiting for self-awareness from this clown. Not surprisingly, unions are part of the protest. I’m guessing that Mr. Canamero represents government employees. The dig against tax havens is particularly laughable. Ordinary Spaniards should hope and pray that their deposits in the local banks are safely re-deposited in banks based in well-run and honest jurisdictions such as Switzerland, the Cayman Islands, or Singapore. And if they’re smart, they already cut out the middleman and directly placed their savings in one of these low-tax jurisdictions. That way, they’re not only at much less risk of a bank collapse, but they also have greater ability to protect their assets from the venal and incompetent tax-hungry political elite. Returning to the mischaracterization of Robin Hood, this Payne cartoon does a good job of capturing my thoughts. 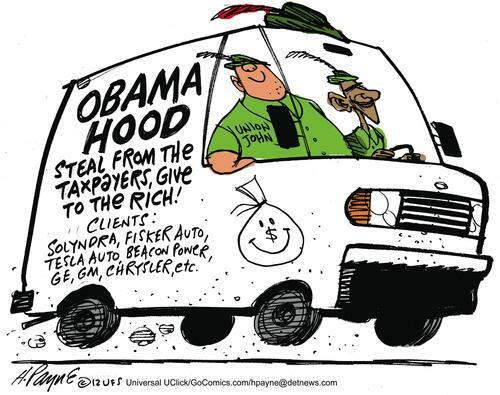 I especially like how Payne shows that the left-wing version of Robin Hood is all about a perniciously corrupt version of redistribution (though he should have included the Export-Import Bank on the side of the van). The genuine poor get crumbs while the well-connected interests make out like bandits. P.S. Other good Payne cartoons can be seen here, here, here, here, here, here, and here. Even though I expressed some support for the Occupy protesters the other day, I strongly reject their entitlement mindset. So you can imagine how I found this image both humorous and accurate. Maybe I’m biased because a lot of my softball buddies are in the military or former military, but each soldier is worth about 100 of the OWS protesters. If you like this type of humor, scroll down on this post. 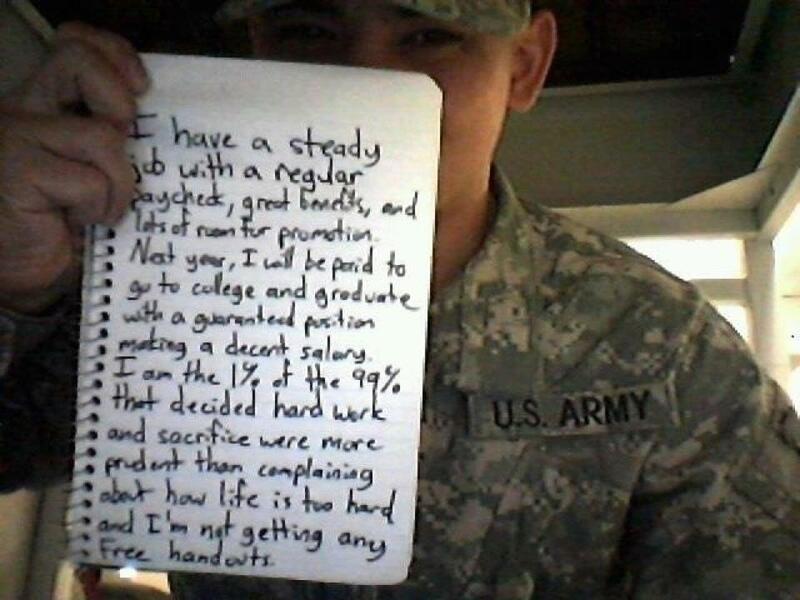 I’ve expressed a modest bit of sympathy for the OccupyWallStreet folks. They may have the wrong solutions, but many of them are properly outraged by the corrupt mix of big government and big business. But it’s hard to remain sympathetic when they keep saying and doing really stupid things. I posted a Howard Stern video exposing some of their inane blather, but the folks at OccupyLondon may be even more clueless than the OccupyWallStreet crowd. 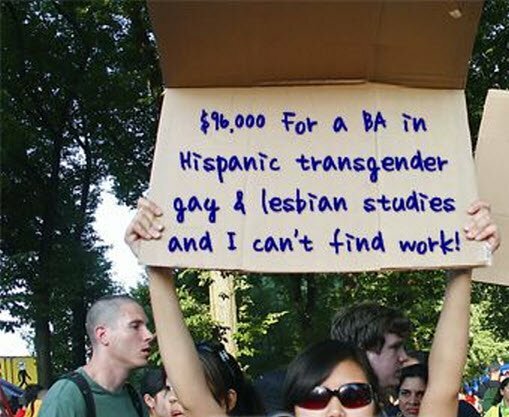 For other examples of OWS humor, see here, here, and here. 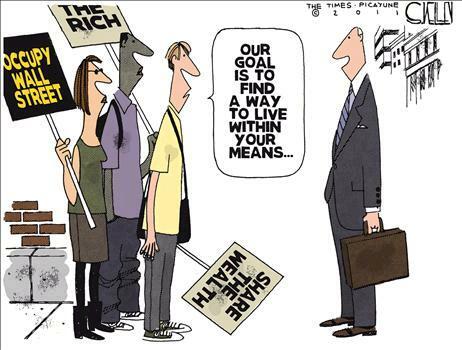 This cartoon is probably more amusing than the OWS jokes I posted a couple of days ago. Making fun of looters and moochers is good sport, of course, so the cartoon is appealing in that regard. I’m not comfortable, though, with the imagery of a rich guy who looks like he is from Wall Street. Give me a group of honest rich people, folks who have accumulated wealth by providing value to the world, and I will defend them to my last breath. The crowd on Wall Street, though, sometimes likes to put its snout in the public trough. That irks me for three reasons. First, I’m strongly opposed to bailouts. Second, I viscerally despise government activities that redistribute from the poor to the rich. Third, I loathe crony capitalism that gives well-connected rich people an advantage in the marketplace. But the cartoon is funny, so let’s not make the perfect the enemy of the good. Enjoy and share.